The company has been around for quite some time now. So much has changed over that time so here is an updated YesAdvertising review for July 2016. Finding innovative ways to help Publishers make the most of their revenue streams. YesAdvertising provides an online advertising solution for both publishers and advertisers. This review will focus mainly on publishers. The network is owned by YesUp Media Inc. which is famous for providing innovative online and offline advertising solutions. YesAdvertising uses the eCPM model to help publishers make the most of their revenue streams in a single platform. Publishers can count on the network’s eCPM model to get the most competitive rates for their traffic quality. Since it was established, YesAdvertising has grown to accommodate over 100,000 publishers currently serving more than 2 billion impressions. The network has a rich database of thousands of offers and campaigns that span over 200 countries. 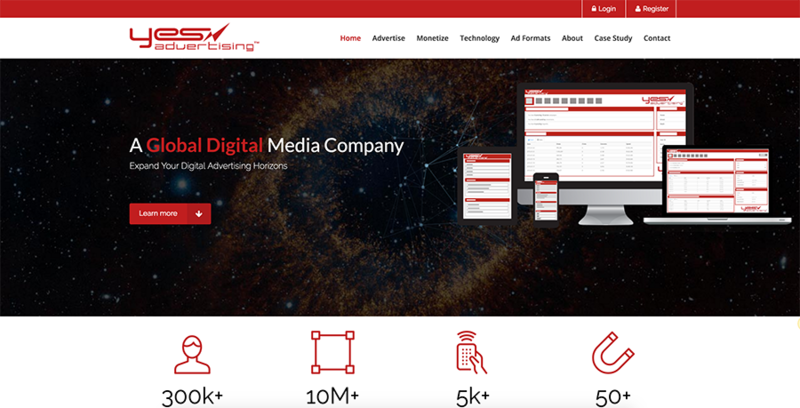 YesAdvertising provides publishers with one of the most lucrative opportunities to monetize their websites and blogs with high paying ads from reputable companies. From an intuitive dashboard, publishers have full control over which ads to run in their sites. You can easily create a campaign of your choice or simply let the system do it for you. The network provides both desktop and mobile optimized ads. Publishers can even customize their ads to improve CTR and other factors that affect performance. The network has an automated system that seeks for all relevant information about an ad within its database such as clicks and views to determine which ad has the best profit potential for your site. Unlike other networks that rely on keyword advertising, YesAdvertising tracks all activities around each ad, to automatically generate the best ads for your website or blog based on your statistics. The network offers publishers a data driven environment to get the most out of their website traffic. YesAdvertising uses different pricing models to compensate its publishers including CPA, CPM, CPL, CPC, and POP ads. This is great for publishers since you are paid for conversions, clicks, and even impressions. Payments are disbursed every two weeks or weekly and always on time. The network has a low minimum payout of just $50. They have multiple payment options including PayPal, Payoneer, Perfect Money, Bank Transfer, and Wire Transfers. Weekly payments are also provided above a certain threshold. Registration and approval is always a headache to many potential publishers seeking to join a good ad network. Unlike other networks that take you through a rigorous application process, signing up at YesAdvertising is a breeze. The network does not have restrictive issues such as minimum traffic requirements and website approvals. Any publisher, beginners and advanced alike, can apply to join YesAdvertising. You only need to fill a simple form to create an account. You won’t have to submit your blog or website for approval before joining the network, but your site has to comply with their terms and conditions. For example, the network does not accept content that is rated NSFW or adult, so if you seek to monetize adult content this may not be the network for you. Otherwise, once you create your account you will be good to go and can start generating tags and placing ads on your website. The network prides itself an efficient customer support that can be reached via phone or email 24 hours, 7 days a week, 365 days. Publishers also have access to dedicated account managers who are always ready to assist you in improving your ad revenue any time you wish to reach them. Like in other networks, their publishers have the option of increasing their revenues through the network’s referral system. The main difference between the referral system at YesAdvertising and in other networks is the fact that this network provides a 10% commission while the rest tend to pay 5% commission. You can make good money by referring your friends or family to join the network and earn you 10% of what they make. You are provided with banner creatives which you can easily add to your blog or website using a unique Referral Code. You become a member of the Referral program once you sign up for a publisher account. What we like most: On time payments, super optimized ads, multiple ad formats, multiple revenue models, an effective and reliable technology for tracking and ad placement, efficient support system who respond to publisher queries 24/7, and of course the almost automatic, hassle-free application and approval process. What we like least: Website approval is not a requirement for being accepted, but your site has to undergo verification before you are allowed to run ads. This is to ensure the site complies with their terms and conditions. Prohibited content from publishers: Publishers will not display the company’s ads on websites that contain adult, pornographic, obscene, libelous, obscene, defamatory, or any form of illegal content. The company reserves the right to disable its proprietary content from any site that promotes the use of illegal drugs, hate or discrimination, or any other activity that is deemed illegal. Ownership: Privately owned by YesUp Media Inc. Ad formats: In-Text, Text Banner, Pop Under, and Graphical Banner Ads. Verticals: YesAdvertising has a huge ad marketplace that gives publishers full control over the ads they wish to run. This ensures better visitor engagement and conversions. Vertical specialties include arts and entertainment, business, careers, automotive, family and parenting, education, gaming, health and fitness, food and drinks, hobbies and interests, sports, technology, computing style and fashion, personal finance, society, and home and garden just to mention a few. Publishers seeking to maximize their online revenue can greatly benefit from YesAdvertising’s list of offers, lucrative payouts, and an accurate, reliable reporting system. Their campaigns come from a wide range of verticals and are sourced from all parts of the world. Better eCPMs are almost guaranteed. The network’s system will help you determine which verticals and ads will perform well with your audience and increase your revenue. They’ve got a rich ad marketplace that gives publishers control over which campaigns to run according to the type of audience their sites attract. Stat Reporting: The network has a very robust and accurate stat reporting system which gives detailed stats on clicks, views, impressions, conversions, and earnings you have made each day. The technology allows you to filter stats reports by multiple options such as by duration, ad zone, website, groups, and so on. The Reports tab is easily accessible from the dashboard. It also gives you the option to save or export your reports as you wish. Control Panel: The YesAdvertising publisher control panel is quite intuitive and easy to navigate. All the major navigation tabs are well lined at the top, with conventional icons for a more descriptive appearance. It is quite navigable even for a beginner in the industry. You can easily access your existing campaigns or create a new one simply by clicking the campaign button. Creatives can easily be accessed via the creative tab just as you can easily find your stats from the Reports section. Find out all your traffic statistics including click through rates and other helpful information by clicking the reports button. Available payment methods: Check, PayPal, Wire Transfer, Bank Tranfer, Payoneer, and Perfect Money. Minimum Payout Threshold: USD 50. Personal Account Manager: Yes, available. Besides these standard support channels of telephone and email, publishers are assigned dedicated personal account managers who can be very helpful in handling both technical and general issues. The company’s support system is quite efficient though. They respond to their publishers’ questions and concerns relatively faster than in other networks. Another great thing about this network is the availability of multiple pricing models that ensure publishers are rewarded for their efforts. The models include CPA, CPM, CPL, CPC, and POP ads. This ensures publishers get all the conversions, clicks, and even impressions produced at their websites. The network also provides different ad formats to suit different types of sites. These are Inline Texts, Text Banners, Interstitial Ads, Pop-Unders and Pop-Ups, and Graphical banners. Payment schedules and thresholds are two things every publisher is always interested in before applying to join any network. Nobody wants to work hard only to suffer delayed payments. YesAdvertising has a good reputation on the payment matters. Payments are sent every two weeks with an option for weekly payment. The network has a low minimum payment threshold of just $50 USD which is great for publishers who are starting out in the industry. They have multiple payment options such as Check, Wire, Bank Transfer, PayPal, Payoneer, and Perfect Money. Applying to become a publisher at YesAdvertising is much easier than in other networks. There are no minimum traffic restrictions and you don’t even need to have your website approved before you join. You just need to fill an application form and you are good to go. Timely Payments: As every publisher will tell you, payments are a crucial issue in this industry. YesAdvertsing is well known for providing timely payments every two weeks. You are paid as long as you meet the minimum earning threshold of $50 USD. Huge database of ads: The network has a huge database of keyword rich ads served in multiple ad formats such as Inline Text Links, Graphical banners, Pop-Ups, Pop-Unders, and Text banners just to mention a few. Efficient support system: The company’s support system and dedicated account managers are a plus too. The support team can be reached 24/7 any day of the week, and are quite fast in responding to publisher’s questions and concerns. Intuitive control panel: YesAdvertising has a very easy to use and intuitive control panel with all the necessary navigation tabs you need. Easy application process: This network has a hassle-free publisher application and approval process. The only downside about YesAdvertising is the lengthy verification process of your website before you can place ads. Website approval is not a requirement for being accepted, but your site has to undergo a verification before you are allowed to run ads in it. This is to ensure the site complies with their terms and conditions. One of the best things about YesAdvertising is its rich database of offers spanning over 200 countries. This ensures that the publishers never run out of campaign options. There is everything for every type of website. The network has a wide range of high paying offers too, ensuring that publishers can maximize earnings from their traffic. Publishers have full control over the type of ads they choose to run in their websites. The system allows you to create your own campaign based on the needs of your website visitors, or simply let the system create the best one for you according to the statistics you have provided. There is also much room for ad customization that publishers can use to increase their conversions. As a YesAdvertising publisher, you are paid high eCPM rates, you have full control over the campaigns you choose to run, international ad serving, you get paid on time through multiple payment options, and always have great support and Account Managers waiting to help you find the best offers to promote.